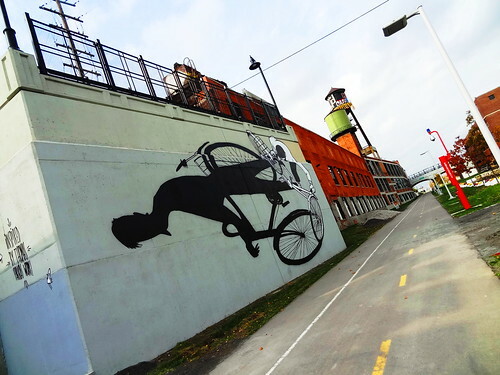 Russell St. is the market’s main drag, we park near new murals by Fel3000ft and Malt. 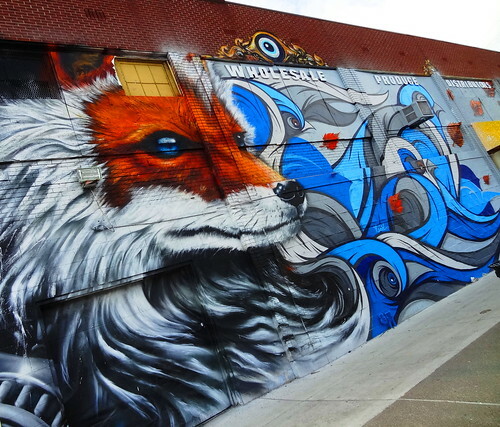 The first is a powerful image of a fox, its face in color as his fur becomes a flowing mane in black, white and grey, gears turn in the background. Tucked beside it is Malt’s flock of blue birds flying into an autumn breeze. 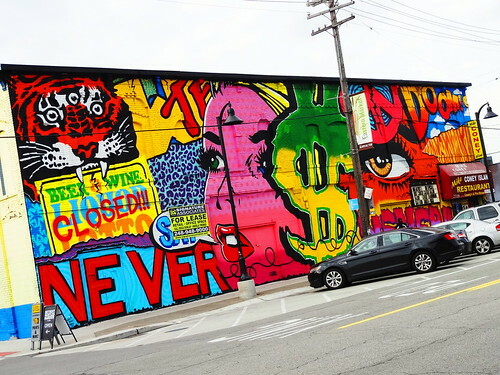 Further down Russell Denial has created another comic-like series of images in bold colors; a tiger, peace sign, woman’s face and the words ‘never say never’, I like this style. From here we just wander the streets looking for new murals, it’s a Friday, trucks come and go down narrow streets, men unload meat, produce and other goods. 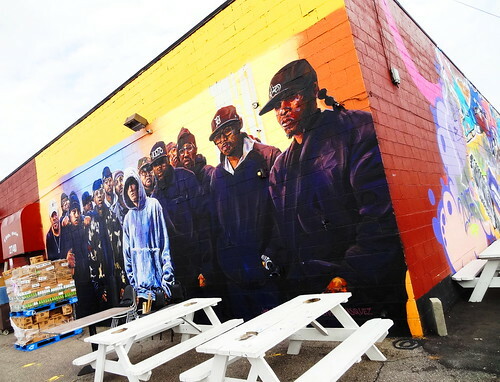 On the backside of Bert’s Warehouse Jose Felix Perez and Michael Vasquez have painted a group of rappers, Eminem is front and center. Picnic tables remain on the patio hoping for one more warm day. 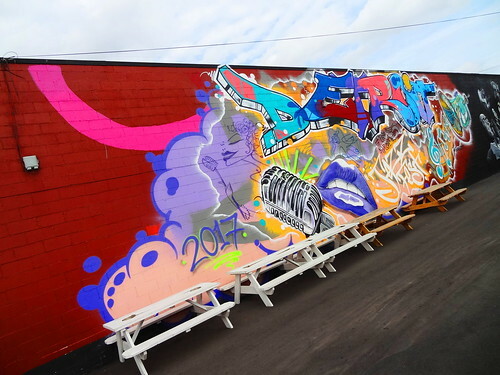 Around the corner is another tribute to musicians; first a scene by Shade anchored by and old-fashioned microphone intermixed with a female singer, musical notes and instruments. 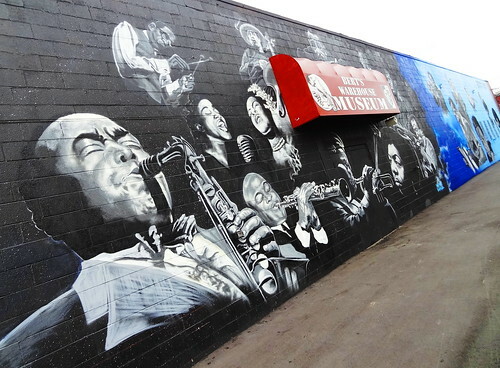 Beside it we find black and white images of Jazz greats; singers, drummers, bass players, clarinet players–you get the idea. 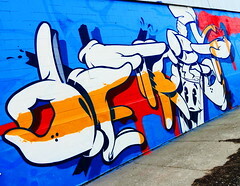 Over a fence is Sheefy’s creation of red, pink, blue, yellow and green body parts. 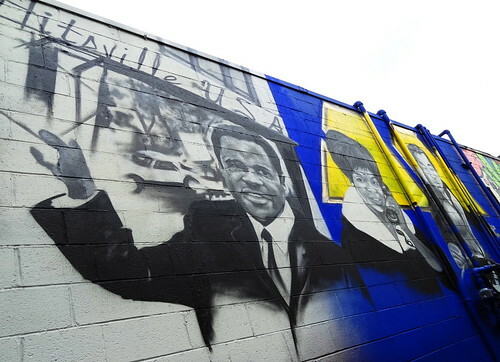 Hitsville USA, Berry and Esther Gordy are portrayed further down on the same wall. 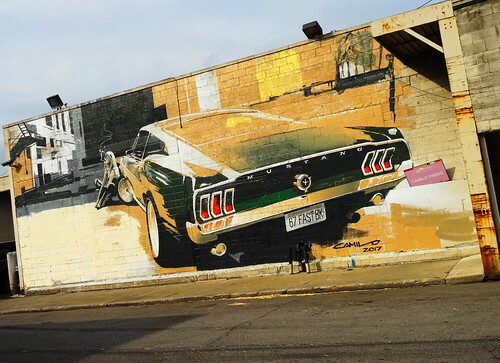 Camilo Pardo has an incredible rendering of a 1967 Fastback Mustang over on Alfred St. A girl relaxes against the front fender, the smoke from her cigarette rises and dissipates. The car is super cool in green and gold; Kris and I really like his style. Tatiana Suarez’s goddess is enchanting against a blue background. 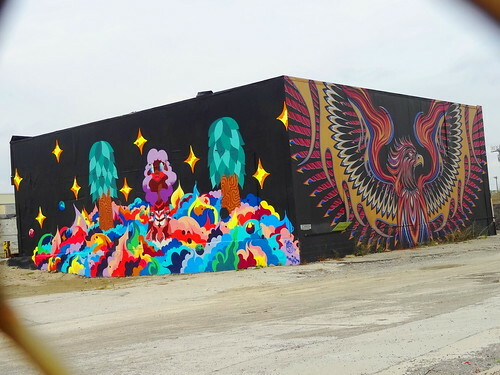 We walk some more, ending up near the Dequindre Cut, a host of vacant building are either being restored or waiting for renovation, it’s really quiet over here, we wander around traversing broken concrete and uneven ground. 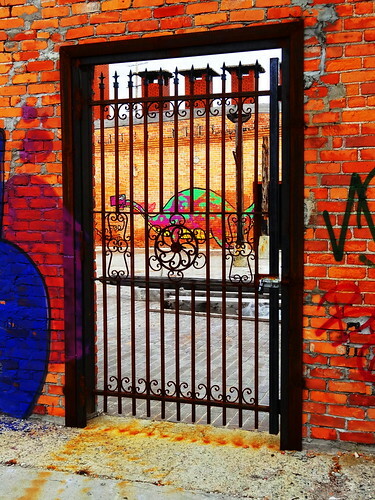 On the Cut we are welcomed by more art, look at the image of the bicyclist and his shadow, the wall of bubbles in blues and purples. 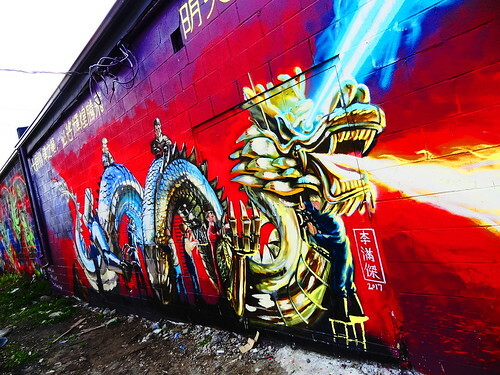 On street level Anthony Lee’s fire-breathing robot-dragon shoots laser beams from his eyes as repairmen make adjustments, the detail is amazing. HoxxoH and Brian Lacey’s scene reminds me of the sea or an aquarium; green leaves, blue reeds and coral-like images. A prism-colored skeleton resides on a funky pink wall, his medieval flail wraps around the building connecting with another skeleton on the other side. A pheasant and an old car occupy two squares of earth hovering above water in Johnny Alexander’s contribution, Paul Johnson’s piece makes me think of life on some other planet where Palm trees grow like upside-down pineapples and stars are huge in the night sky; Chris Saunder’s eagle takes up the adjacent wall. 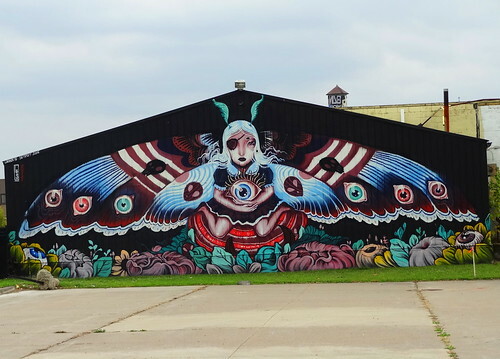 Street after street, building after building, at every turn another mural comes into view, Lauren Y’s moth-girl is beautiful, the tunnel created in greens and yellows by 1010 makes me want to climb up and look inside. 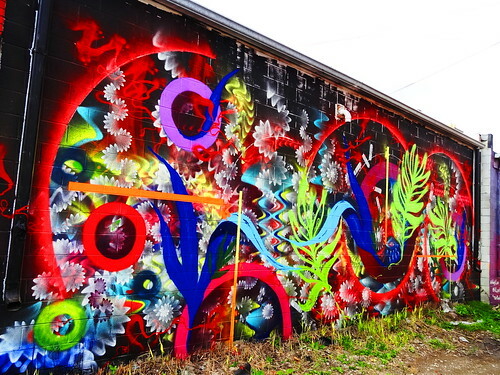 HoxxoH’s piece on Mack reminds me of a giant Spirograph, love it! Hey, did you know they still make Spirograph? If you like astronomy check out Mary Iversons constellation piece near St. Aubin. We’ve walked enough, let’s grab some lunch. 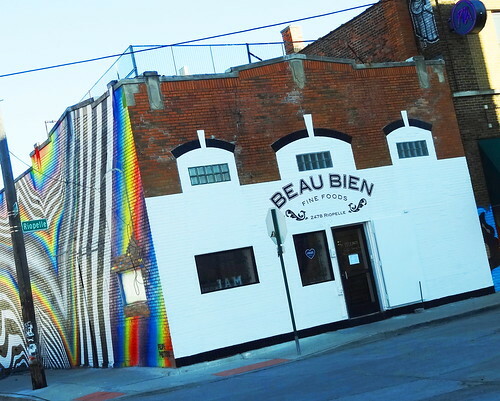 Beau Bien Fine Foods shop and cafe opened a few months ago on Riopelle. They have been making jams, mustards and chutneys for years, we have seen their products at maker fairs and local markets; the Peach Bourbon Vanilla Preserves won us over immediately. The shop is a mere 400 sq. ft, it’s adorable; a crystal chandelier hangs from the black ceiling, the black and white tiled floor looks vintage. 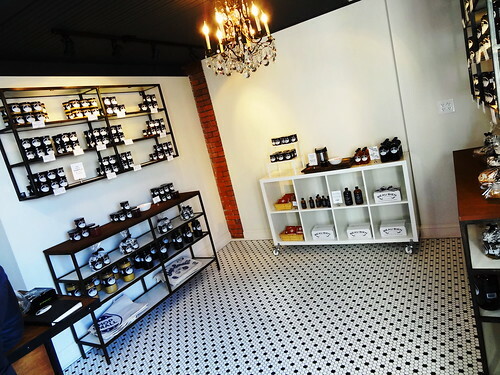 Walls are lined with jarred preserves, chutneys and vinegars all made with Michigan fruit. We order at the register and have a seat at the counter at the far end of the space. First to arrive is a bowl of steaming Tomato soup, delicious. 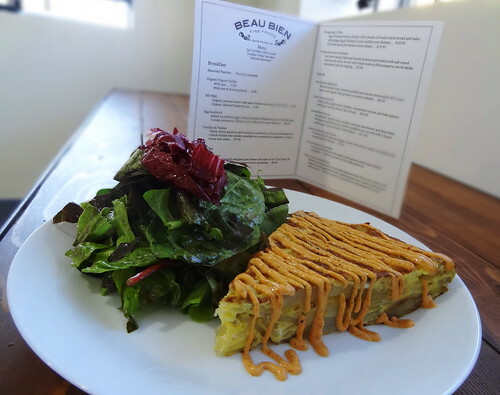 The tortilla de patatas is next, it’s wonderful, the kick of the chorizo-spiced mayo is perfect, a mixed green salad is served alongside. You can sample anything they sell for free; Kris really likes the Plum Honey preserves, I’m torn between the Michigan Apple and the Cranberry Mustard, Cranberry wins, I’m quite satisfied with my decision. 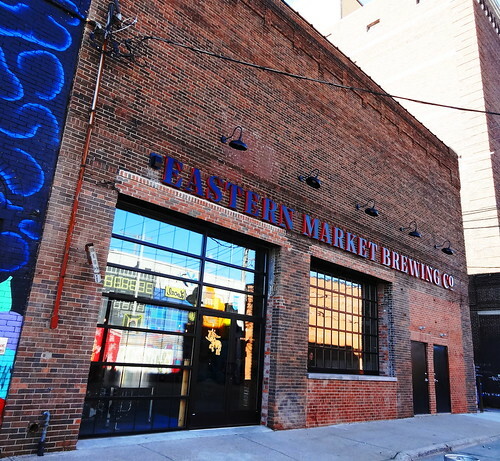 Back out on Riopelle we find ourselves standing in front of Eastern Market Brewing Company; the building has undergone a complete rehab and is now a fully functioning brewery and tasting room. Eastern Market has been home to dozens of breweries over the past century, EMBC continues the tradition. The brewers use ingredients from market vendors and local businesses whenever possible. The interior is a large, open, airy space, front windows roll up when the weather allows, the garden wall is really pretty with live plants and wrought iron accents. 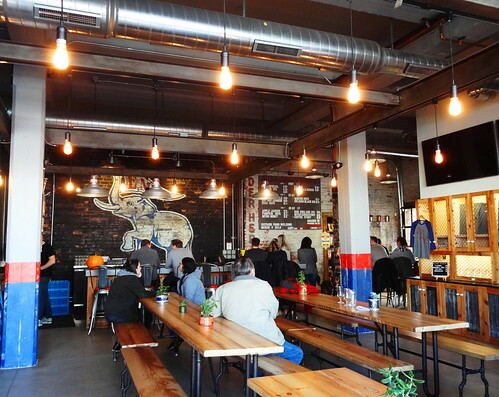 Community tables rest on concrete floors, the EMBC elephant is painted on the wall behind the bar. The menu changes seasonally, so many choices, the only thing to do is try several. 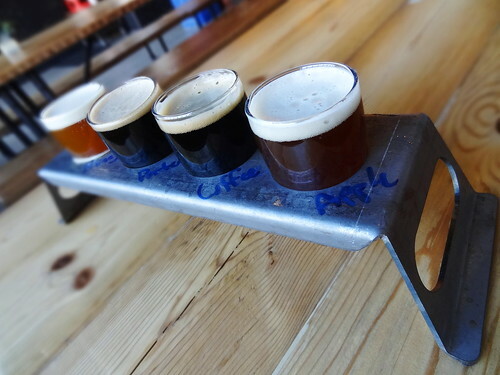 Our sampler includes Cherry Porter, Apple Jacked, Coffee Stout and Nitro Honey. Being a dark beer girl I am surprised that the Apple Jacked is my favorite, Kris’s favorite is the Nitro Honey, no surprise there. 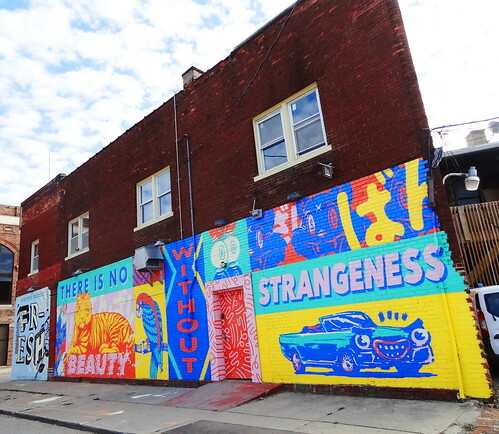 We meander the maze of market streets back to our car, we park in a lot so we can view the murals along Gratiot. 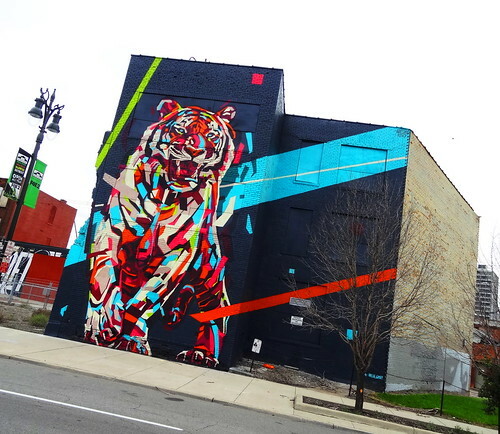 A multi-color tiger looks fierce, he’s so big he takes up the entire side of the building. 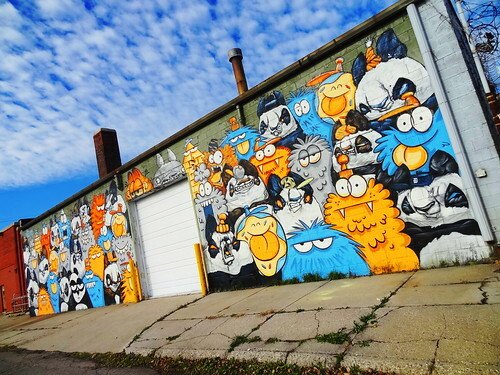 The wall of cartoon-critters makes me smile, another mural welcomes us to Eastern Market Fresh, Lunch Money’s piece reminds us ‘there is no beauty without strangeness’. 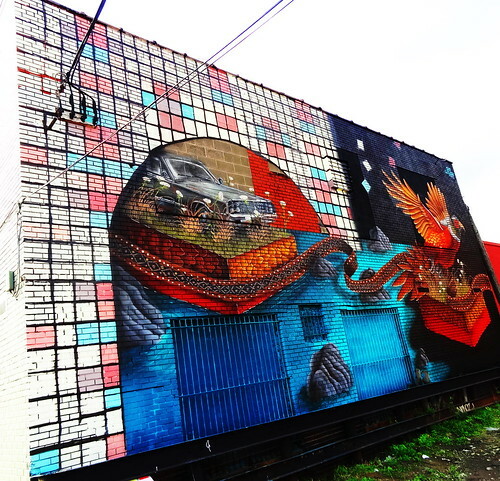 Our final stop is Pat Perry’s piece, I love his work and this piece is exceptional. 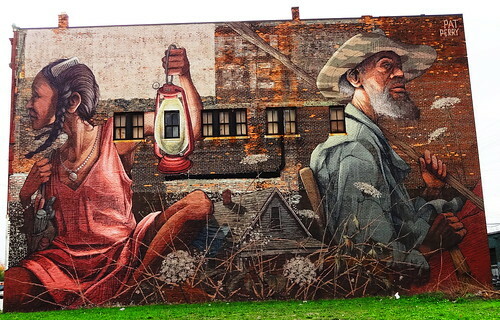 The entire side of the building is his canvas, just look at the detail; the woman, the man, the house, the wildflowers and the placement of the lantern. The mural looks completely at home, it belongs in just that spot. It catches me completely off-guard, I draw a breath in and stare, it’s perfect.